With a growing amount of research revealing the dangers of certain plastics, it’s a great time to reduce plastics in your home. Thankfully, a reduction in plastic use tends to be a by-product of a natural lifestyle – whether your initial aim was to do so, or because you’re now so fond of canning jars you use them for everything. With clear research pointing to the dangers of prolonged uses of certain plastics, it’s important to find alternatives to as many plastic products as possible. Here are some of our favorite ways to do that. Replace plastic dishes with glass, bamboo, metal or ceramic alternatives. If you have children, look for heavy-duty dishes that don’t break easily. Better yet, search out your new dishes at a local thrift shop so if they do get broken, it’s not a big deal. Use canning jars as cups. For kids, try a stainless steel water bottle or a small canning jar instead of sippy cups (if they need an easy-to-drink-from lid, get a Cuppow). Plastic water bottles can leach toxic chemicals into your water, especially if they sit in the heat all day. Opt for a stainless steel option instead, like Klean Kanteen, or the insulated Hydroflask. Diapers also contain harmful plastics. Try using cloth diapers as much as possible if you have little ones who aren’t yet using the toilet. Even if you exclusively breastfeed, there’s bound to be a time when your baby gets a bottle of breast milk or water. Many baby bottles are now BPA-free, but for a non-plastic alternative, try glass baby bottles. Hormone disruptors in commercial deodorants (and their containers) can make their way into your body. Make your own deodorant and store it in glass spray bottles. Did you know you don’t have to use pads and tampons? Really. Cloth pads and silicone menstrual cups (a very comfortable option) are hormone-disruptor-free options that are great for the environment and your budget. Instead of a toy box full of plastic cars and blocks, aim for a few wooden toys instead. There are many options available, many of which are handmade. Even toy kitchens and their cute little accessories are available in wood. Also look for toys made with other materials like cloth and felt. Homemade laundry detergent is one of the easiest DIY projects you can find. Store your laundry detergent in a large glass jar and use a metal or wooden scoop. Homemade dishwasher detergent takes a few simple ingredients and can be stored in a canning jar under your sink. Reuse cloth drawstring bags to buy food from bulk bins. Write the bin number on the bag with a washable fabric pen. Eliminate the plastic bags in your home by taking your own reusable grocery bags to the store. If forgetting to bring them with you is a problem, choose bags that fold into pouches to keep in your car or purse (like these). Buying direct from farmers is a great option for reducing food packaging. Don’t forget your reusable bags. Click here to read about other inexpensive ways to get local food. Certain herbs and essential oils, like lavender and lemon are great at keeping bugs away. Here’s our recipe. Commercial body washes can contain phthalates, so making your own is a great way to avoid exposure and reduce the amount of plastic containers coming into your home. Our homemade body wash is fast and easy to make. If you’re a fan of bar soap and want to give it a try, here’s a great homemade bar soap recipe. The outer coating on many pills contains phthalates. If you take prescriptions or supplements, opt for a vegetarian capsule, or other form, if you can. If you’re planning on going out to eat or know you’ll grab a drink somewhere on the way home, take some reusable to-go containers. Take a glass jar or storage container to the restaurant to put your leftovers in. Keep a jar or stainless steel bottle in your car to use at your favorite coffee shop. You might even get a discount for bringing your own cup. Many people use plastic utensils to avoid scratching Teflon-coated pans, which is harmful in itself. Instead, try metal or wooden utensils (and switching to stainless steel or cast iron cookware if necessary). My kids LOVE straws and would quickly breeze through a package of plastic straws when I still bought them. Now, each family member has his/her own reusable metal straw that will last forever. BPA is commonly found in the lining of many canned foods, which can then leach into the food itself. Try canning your own vegetables, soups and even meats in glass canning jars. Click here for some great tips on food preservation. According to the National Resources Defense Council, 12 out of 14 common air fresheners contained phthalates, even though they were not listed on the ingredients label (source). Instead of using chemicals to freshen your air, open a window for at least a few minutes each day. If you want a nice smell, try diffusing essential oils or making your own room spray. Some great essential oils to use are orange, lemon, lavender, peppermint and wintergreen. 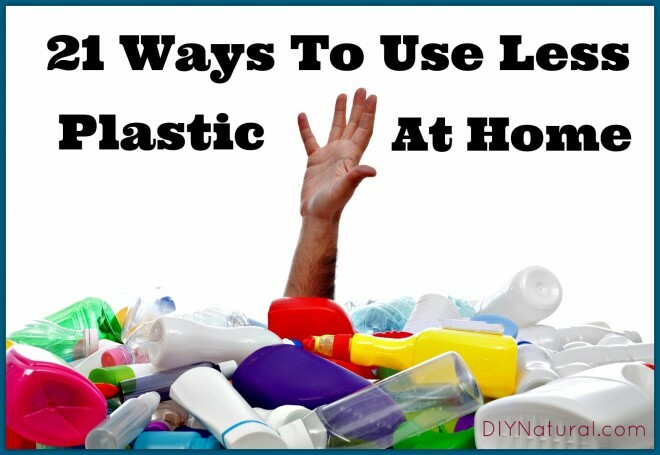 How have you reduced plastics in your home? Love these ideas! There are a few that I haven’t incorporated yet that I will be using soon. Any ideas how to handle trash? I hate having to pay for a plastic bag to put trash in! We compost and recycle and end up with a very small amount of trash, but still need a place to put that yucky stuff that can’t be recycled. How about cardboard boxes? Not perfect, but better than plastic I think. We save shipping etc. boxes and use them for some trash (or storing things). I collect plastic shopping bags from friends and crochet them into reusable bags. The grandkids use them to take their bathing suits and towels to the pool. My sister-in-law uses them to take extra clothes with her. I use them to bring my groceries home. The uses would be endless. Everywhere I go people are always asking me where I get them. I love when reusable menstrual products get a shout-out, like the menstrual cups. In a lot of these DIY and Natural type blogs, it seems to be a point that is totally skipped. Thank you! We collect metal tins–popcorn tins, Christmas tins, etc. and use them to store everything from Legos to game pieces to remote controls to math blocks to office supplies…. Awesome tips! I definitely try to stay away from storing our left overs in plastic containers. I use those Pyrex glass containers but just realized that their lids are plastic. Does anyone know if they’re BPA free? Not sure if your lids are BPA free, it depends on when you bought them, but we do know that new Pyrex containers do come with BPA free lids. Whenever I buy things in bulk through buying clubs, etc. I transfer the food from the plastic bags and containers they usually come in to glass jars for storage. Then put a pretty label on it. The biggest problem I have is how to freeze my garden produce and baked goods without using plastic freezer bags. Any ideas? You can freeze vegetables and baked goods in glass tupperware containers (or mason jars, like the large half gallon size). Other options that come to mind for preserving vegetables include canning and fermentation. I’m wondering if the Brita pitcher is still a good idea. I use it at work so I can drink water all day. Is there a better solution? Thank you. Berkey water filtration systems are the best we’ve found. We use them, love them, and highly recommend them – much better than Brita! Thanks for the good tips! Just FYI, I purchased a glass straw and love it. Any ideas on how can I store romaine lettuce without plastic? We use these large glass storage containers and really happy with them. We recycled glass vases from flowers (or you could buy them at the thrift store). We do put a plastic “bonnet” on the top so it doesn’t dry out but those can be used multiple times. We like it because the lettuce stays fresher and the height takes advantage of otherwise wasted space on our top shelf. Just wondering the best way to store homemade shampoo, conditioner in the shower? I use plastic right now, but don’t necessarily want glass that could break in the shower. Could you use the stainless steel water bottles for keeping the shampoo and conditioner in? Thanks so much for sharing these ideas. We use glass whenever possible. I have glass refrigerator storage and of course mason jars. My freezer and pantry are full of them. I also use fabric paper towels and also try to wrap my food in fabric storage cloths! I actually sell them in my etsy shop as well. I am not so good at using the fabric bags at the grocery, but I am working on that. I love your DIY natural letters but am often frustrated that ingredients you suggest are not available in the UK. Do you have a British counterpart?